Size = 23" Diameter - Outside Measurement from Feather Tip to Feather Tip! Elegant Party Theme Look...or Beautiful Christmas Wreath. See Our Other Listings for Other Popular Color Choices. Please Note: Wreaths are Made with an Interior Wire Frame Center & No Styrofoam. Safe Covered Porches or Interior Use Only. 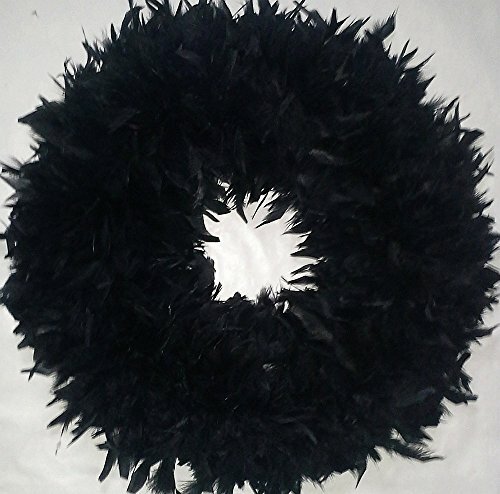 Beautiful Black Feather Wreath for Halloween...Nice! A Perfect & Wonderful Gift Item...Everyone Loves These! If you have any questions about this product by SmileyMe Feather Wreaths, contact us by completing and submitting the form below. If you are looking for a specif part number, please include it with your message.